A year after Dory (Ellen DeGeneres) helped Marlin (Albert Brooks) find his lost son, Nemo (Hayden Rolence), the trio are living happily as a family. The normally forgetful Dory begins to have flashes of memories as a young fish. During these flashbacks, Dory starts to remember her parents. As they become more frequent, she sets out to find her family. 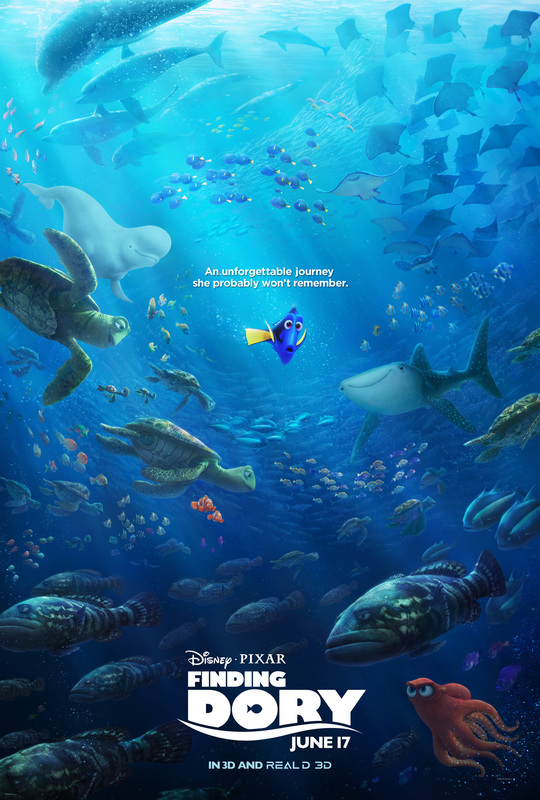 Dory’s search leads her to the Marine Life Institute, a rehabilitation center for aquatic animals. With help from Hank (Ed O’Neill), an octopus longing to get back to the ocean, and some long forgotten childhood friends, Dory gets closer to finding her parents. Meanwhile, Marlin and Nemo are desperately searching for their missing friend. Along the way, everyone learns a lot about the meaning of family. Putting together a sequel to 2003’s incredibly successful Finding Nemo, Disney and Pixar had some big shoes to fill. They had set the bar so high with the original, making a worthy sequel seemed out of reach. Fortunately, Andrew Stanton wrote and directed a fantastic film focusing on everyone’s favorite forgetful fish. I was afraid centering the story on Dory would lead to a lot of easy, repetitive jokes about her short-term memory. While this is obviously a focus, it is not overdone. The story goes much deeper than just surface-level jokes. The movie has heart. Ellen DeGeneres and the rest of the cast are excellent in their individual roles. Those reprising their roles bring back all the charm and familiarity from when we met them many years ago. The newcomers add more depth to the film and a little more backstory to your favorite characters. The underwater world created in the sequel is every bit as wonderful as Finding Nemo. The visuals are stunning and make you feel as if you are in the ocean, on the journey with the characters. The personality of each of the creatures and they actors who portray them come through in every scene. And the young Dory is almost too cute. Described by my 6-year-old as sad, silly, weird, but mostly funny, Finding Dory is a great film for the whole family. While it isn’t quite as good as Finding Nemo, it is very close. The movie takes you on an emotional journey with just enough laughs to keep it light. The cute characters and memorable scenes will draw you in, hook, line, and sinker. A definite must-see.